I have known Helen Wyman for a good few years and have seen her develop from being a good national level racer to be an international elite, mixing it with the best cyclocross racers in the world. She and husband Stefan have been well known personalities in the world of cycle racing, often seen at events around the UK, as well as across Europe. I managed to catch up with Helen while at The Wyman Review, an event hosted by one of her sponsors Look Mum No Hands. That evening Helen talked about the importance of helping the future generation of women cyclocross riders, particularly the under-23s. With that in mind, she is spearheading a crowdfunding initiative, the Helen 100 to pay the entries for 100 under-23 women riders to enter the National Cyclocross Championships next year, and engage them in the sport through other activities. When I was a kid, I wanted to be a doctor when I grew up, but then I didn’t get the grades, so then I thought, "oh I’ll become a physiotherapist", and I studied for a degree in physiotherapy from the University of Hertfordshire. I started bike racing from the age of 14 and continued while studying at university, and I was always good at it. My brother used to race when I was a kid, and that’s why I started racing - because I wanted to beat him! He now runs a bike shop in Sheringham, Norfolk, called Black Bikes. My family have always been into cycling. My dad used to race when he was young, but only time trials. Then he started racing again on the grass track when I was 14. These days they still ride, but they don't race. My parents even cycled from Lands End to John ‘o Groats for their 50th birthdays. My mum still rides, though now she has an electric bike. Stef even wants to get one too so that he can ride with me! It was when I won a National Trophy race in the UK in 2004 that Stef suggested that I become a full-time racer. At the same time British Cycling needed people for their Great Britain road team that summer. They needed six riders at every race so that the Olympic development riders could put in some good training. I happened to be in the right place at the right time, and so I rode with the team. I went from doing 60-mile road races to doing a 3-day stage race, a 10-day stage race, and some of the biggest women's cycle races in the world, racing distances I never even dreamed I could ride. So off the back of that I learned how much my body could take. 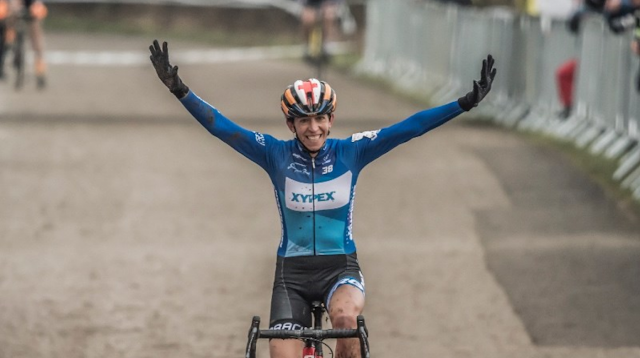 When I came back to cyclocross after that summer I came 6th or 7th in every world cup race, and from that point I thought, "right well I know I can do this." It was that opportunity to ride with the GB road team that taught me what I could and couldn’t do. It was like a switch flicked and cycle racing was something that I knew I could achieve in. I don't think I was more privileged than anyone else. I just think I had the opportunity. I had the talent, and I could do the training. Another rider could have done what I did and they may have died and cracked and not actually ridden anyway, so they wouldn’t have got the benefits. I don’t think there’s such a thing as talent alone or training alone that makes you a good bike rider, but a combination of many things. Even if you have just an inkling of talent you can take it an incredibly long way - it just takes opportunity, determination, dedication, desire, access, and time. There have been points when I didn't know where money for my rent would come from, but I still carried on because I believed I would get there in the end. I had set off from the UK in a donated £100-Peugeot 205 to go and live in Belgium and start this biking adventure in cyclocross, and I was very determined! We’ve grown into a society that wants instant success. Instant appreciation like Instagram. You judge yourself on how many "likes" you get. But Stef’s always said that there are people in the world, that if you put £5 in front of them on a table and then £10 on the other side of the table, they will take the £5 because they can't be bothered to lean across and get the £10. And sometimes in cycling you have to leave the £5 and work out how to get the £10, and that’s what makes determined people. Now I own my house in the South of France, I have a good income, a nice life, a good job, and I win bike races. These days there is more money in the sport than when I first started, so there is way more opportunity. This season I’ve probably doubled my prize money from any other year just because in C1 races the prize money for women is equal to the men's, and every race in Belgium is a C1. So I have made more money than ever before, because of the prize money. If the climate was the same in 2004 as it was in the 2017/18 season, then for the same level I was achieving in 2004 I would have reached a comfortable financial position sooner than it has taken me. So I think there is more monetary opportunity for good riders, but you have to get good enough to take that, and getting good enough is the hardest part! I’m not actually money motivated. I know it drives life and you need money to exist, but for me it didn’t matter at the time that the money wasn’t what it is now. It was the fact that I could actually go out and achieve something for myself. 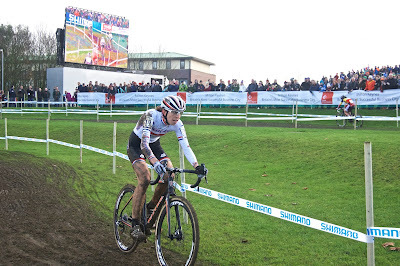 I am doing some crowdfunding, the Helen 100, in order to pay the entry fees for 100 under-23 women to take part in the National Cyclocross Championships in 2019. The plan is to pay their entry fee, but now that I have raised the £2,500 needed to do this the next phase is to actually engage with those riders. So the aim is actually to try and create a legacy by going out and doing cross clinics in England, or providing things like jet washes they can use during races - just for those under-23 women so that they might actually get inspired in some way to stay in the sport. It is hard growing up nowadays with social media and all those things. You are getting judged all the time. So it is important for young women to be in an environment which gives them confidence, which teaches them how to appreciate what they have, how to set goals, how to achieve things independently, because ultimately it is only you that pedals that bike. And if you gain confidence in that way you can take that into later life and you can use it in business, in work, in whatever you choose to do afterwards. I am focusing on the under-23 women because I get the impression that there are huge differences between the riders racing in that category and there are high drop-out rates from the sport. The very best riders like World under-23 cyclocross champion Evie Richards are supported by British Cycling, and then there’s a massive gap to the next riders, and those ridees aren’t supported by anyone. As part of the Helen 100 crowdfunding initiative, for every £10 you donate you get a free entry into a prize draw. There are various prizes on offer, like a weekend stay in a bed & breakfast in Wales, a signed jersey, hats, socks, T-shirts, squeezy bottles, and signed race numbers. One of my best memories in my career was the World Cup race that was held in Milton Keynes in 2014. That was amazing! As a British rider it was just ridiculous. Everyone who went there really enjoyed it. The Milton Keynes World Cup kind of became this urban legend, because they never did it again. And they had more people spectating that than they did at Koksijde [sand dune] World Cup that year! Milton Keynes was huge, the racing was fantastic, the course was fantastic, and the riders loved it. As a British rider it was epic! My ears were still ringing three days later, and that inspired me to write an open letter to future cyclocross racers. It was a letter to say other people could feel the same, and experience the same thing as me if they wanted to. It's up on my website, and every two or three months someone retweets it! And I’m like "wow this was four years ago!" But even though it was a few years ago when I wrote the letter I think what I wrote still holds true today. The 2017/18 season was really good, and I’m really happy with how it went. I won seven races, and the National Championships, that’s cool. I got a podium place in World Cups, that’s cool. So it's been good. Now I am going on holiday to Mexico, I'll have a rest, and then restart my training. Everything I do is for 'cross. In the summer I do a bit of road racing, some mountain biking though not racing. Plus I do running and core training. I make sure I ride my 'cross bike once a week throughout the summer. My permanent home now is in the South of France, below Carcassonne, near the Pyrenees. It’s amazing. The roads are stunning and the riding is deathly quiet. You can go out for four hours and not see a single car. And when you see a car, you think, "Whoa where did that come from? Oh, I’m on a road!" The weather’s great, it’s just perfect. I spent 10 years living in Belgium, but now we just spend a few weeks at a time there over the winter, go back home for a while and then return to Belgium. I would need lots of Vitamin D tablets if I had to stay in Belgium for more than a month! Things were quite difficult for me during the 2016/17 season. Because of the nasty crash I had during the European Championships in which I broke my collarbone, from 13th October 2016 to 16th January 2017 I didn't race. Coming back from injury was tough physically and emotionally. When I went to have the dressing on my shoulder removed I really fell apart, thinking my arm would drop off. At times I questioned myself. But Stef was there for me emotionally. I was 35 at the time – an age where a lot of people are retiring. But at no point did I think of stopping, and that was the driver that kept me going. I told myself there was no way I would want to end my career on a season like that. There’s no way I could do that so I had to come back. After two or three weeks back on the bike I did the Hoogstraten Superprestige race and came 2nd, and I raced in the World Championships. And I think that motivated me for the rest of this year. That showed that I am still there, that I am still capable and so I went out and put in a big summer’s training and came back stronger. I still think I can get stronger and better again. So that’s really exciting and I’m not looking at retiring at any point soon. In 2014 I came 3rd in the World Championships. I thought that this year the course would go my way again, but I actually peaked at the Nationals, which meant I had peaked too soon. Because I didn’t even get to race the Nationals last year I had really really wanted to win it this year, and that was one of my biggest goals. So maybe that took the edge off my strength for the Worlds, and I didn’t have the same level that I could have had on the day. So the Worlds will be my target for next year. They will be in Bogense, Denmark. It was where a World Cup was held this year, and I placed 2nd. If I can be the fittest I can possibly be at the Worlds on that day and everything works out then there is no reason why I can’t get a really good result. As well as placing 3rd at the World Cyclocross Championships in the 2013/14 season I also won the European Championships. It was the muddiest race I have ever done. It was held in Mlada Boleslav, Czech Republic. After the pre-ride I had to go back to the campervan and shower before the race, it was that muddy. I couldn’t just change my clothes, I had to shower right before the race! That was pretty funny. I had never had to do that before, and I have never done it since in any race. The race was epic, and I won it by a minute and a half. It was so muddy it was ridiculous. Everyone needs a Stef! If you go to the discount section of the DIY store, near the back, next to the power tools you’ll find a whole selection of Stefs, but I can't guarantee that they will still be there when you get there! Seriously, we met at a bike race, and he’s been an integral part of my life in many ways. He sometimes pushes me more than I push myself, and other times we work really well together. He is as invested in my career as I am and that is a really good thing to have because it means I can entirely trust everything he says. He wants the best for me because when I achieve he achieves, so it’s a very trusting, working relationship. Sometimes it's tough, like when I have a bad day at a race and he has to tell me what I did wrong and I’m not accepting of it, it gets rough. But at that point I have to say this is my coach talking and not my husband. We don’t always get it right, but I think we have found a pretty good balance as to how to make it work. And everything outside of bike riding and racing is awesome! I don’t know where I get my determination to race from. I just love riding a bike because it gives me freedom. Even if I didn’t race I would still ride a bike and I would love it. Donations can be made to The Helen 100 crowdfunding page until 4th March 2018.